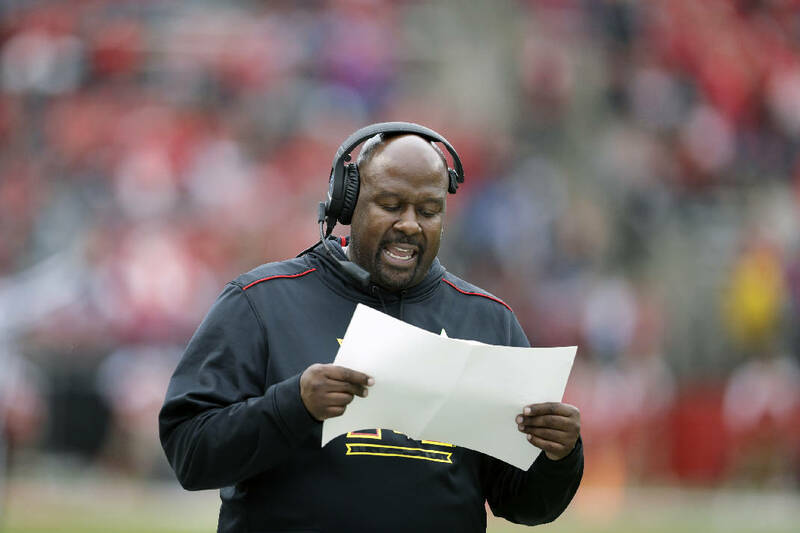 Mike Locksley, shown during a game against Rutgers in November 2015 while serving as Maryland's interim head coach, is headed back to Maryland as the Terrapins' full-time head coach. But first he has work left to do as the offensive coordinator at Alabama, which will face Oklahoma in a College Football Playoff semifinal on Dec. 29. It wouldn't be a College Football Playoff without Alabama, and it wouldn't be Alabama without a coordinator on his way to a head-coaching job. Nick Saban's Crimson Tide are making their fifth playoff appearance in the five-year history of the four-team event, and this will be the fourth straight year in which Alabama will prepare for a national semifinal with a lame-duck coordinator. The No. 1 Crimson Tide (13-0) will play No. 4 Oklahoma (12-1) in the Orange Bowl on Dec. 29 knowing that offensive coordinator Mike Locksley will be days — or hours, depending on the outcome — from becoming the full-time head coach at Maryland. Locksley was announced as Maryland's coach Tuesday night and will be introduced today, with ESPN reporting that he plans to remain with the Tide through their playoff run. "Mike has done as good a job as any guy in the country could do in terms of the way the players have responded to him, the way he's implemented the system that we have and the way he's used the players that we have on offense," Saban said before Saturday's 35-28 victory over Georgia in the Southeastern Conference championship game. "The success that we've had is certainly a reflection on the job that he has done." Alabama's run of playoff preparation with coordinators on their way out the door began in 2015, when defensive coordinator Kirby Smart assumed the added role of Georgia's coach. In 2016, offensive coordinator Lane Kiffin balanced assisting Alabama with becoming Florida Atlantic's new coach, and the Tide's defensive coordinator this time last year, Jeremy Pruitt, was on the verge of being announced as the new coach at Tennessee. While assistant coaches juggling multiple roles can be distracting, Alabama would be seeking a fourth consecutive national title had former Clemson quarterback Deshaun Watson not guided a late touchdown drive for a 35-31 victory over the Tide in the title game of the 2016 season. Alabama's 2016 playoff run did encounter turbulence before the loss to Clemson, with Saban releasing Kiffin after a 24-7 win over Washington in the Peach Bowl semifinal and handing play-calling duties to Steve Sarkisian in the national championship game. Locksley came to Alabama after the 2015 season and spent 2016 as an offensive analyst assisting Kiffin and then Sarkisian. He was the receivers coach last year under Brian Daboll, who left the Tide in January after last season's championship drive to become the offensive coordinator of the NFL's Buffalo Bills. Alabama has averaged 47.9 points and 527.6 yards per game this season. The Tide have set program records for points (623), total yards (6,859) and passing yards (4,231), with sophomore quarterback Tua Tagovailoa having thrown 37 touchdowns and just four interceptions to earn an invitation to Saturday night's Heisman Trophy ceremony in New York City. Locksley was named Tuesday as the winner of the Broyles Award, given annually to the top assistant in college football, and he is considered one of the top recruiters in the country, having helped Maryland sign eventual NFL stars Vernon Davis, Stefon Diggs and Shawne Merriman during his two previous stints with the Terrapins. He was their offensive coordinator from 2012 to '15 and served as interim head coach for the final six games of the 2015 season. "This has always been a special place for me and my family, and I am honored to take on this role at the state's flagship institution," Locksley said in a Maryland release. "Our goal is to create an atmosphere and environment focused on the total development of our student-athletes." As for the search for Locksley's successor, Saban could turn to quarterbacks coach Dan Enos, who spent the past three seasons as offensive coordinator at Arkansas. Enos was Central Michigan's head coach for five seasons (2010-14).